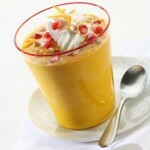 My grandmother used to serve a lot of simple, not-too-sweet fruit desserts such as baked fruit and compotes. After the spread of commercial bakery products, many of us have forgotten about this option: it always seems easier to buy a box of cupcakes… however, when you start feeling like you’ve had way too much sugar, and you need a break, it’s time to go back to the good oldies! 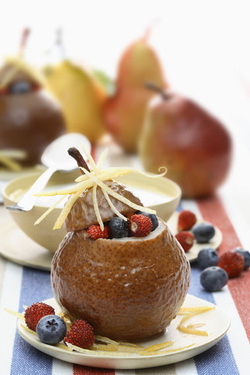 While you may choose them mostly because they are waistline-friendly (especially if you are switching from cupcakes), cooked fruit desserts have the added bonus of vitamins and fiber, and many find them more appealing than raw fruit on cold fall and winter nights. Wash the pears and cut of a small slice from the bottom so they can stand straight. Without peeling them, place them in a parchment-lined pan. Sprinkle them with brown sugar, and a few flakes of butter (or brush with the almond or coconut oil). Bake in a pre-heated 350 F oven for about 30 minutes or until soft, but still firm. Allow to cool off for a few minutes. When they are still warm, but not hot, slice off the top and core the inside. Fill the cavity with the lemon sorbet and the berries. Put the tops back on and decorate with lemon zest. 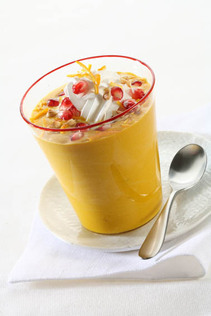 * if you don’t feel like anything frozen, you can replace the sorbet with a mix of ricotta, greek yogurt, and honey. Wash the chestnuts, make a slit in the side of each one, and cook in boiling water for 30 to 40 minutes or until tender but firm. Skim them out, and the brown skin should come off easily. Taste them, and if they are not well cooked you can put them back in the boiling water or in the microwave for a few minutes until tender. Using a food processor, grind the graham crackers into a powder; add the grated apples, and the mashed chestnuts (you can use a potato masher. you can also mash them in your food processor, but it won’t get rid of any residual peel, which is why I prefer the potato masher). Add the cocoa, sugar, milk or soy milk, salt, and egg yolks, and combine well. 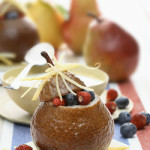 In a separate, clean bowl, beat the egg whites until they form stiff peaks, and incorporate them carefully into the mix. Pour the mix into a greased baking pan dusted with brown sugar, and bake in a pre-heated 350 F oven for about 30 to 40 minutes. Serve cold. The word minestrone derives from the Latin verb ministrare, which means ‘to administer’. Maybe because, as any Italian mother can witness, it is the most efficient way to administer lots of healthy vegetables to picky children, with few complaints! 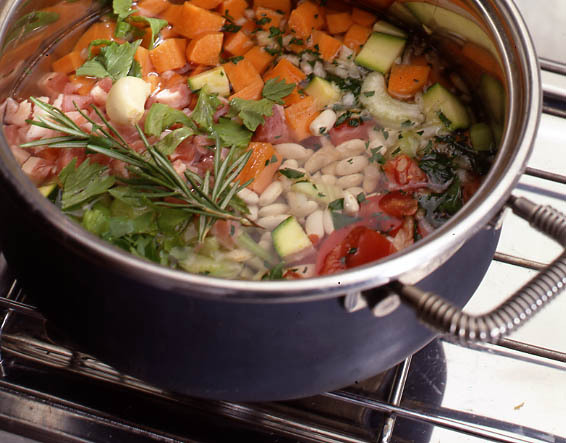 In many households, minestrone is made at least weekly and (thanks to the fact that it tastes even better when reheated), served several times as a primo piatto (first course) with both dairy and meat meals. I usually serve it plain on the first day; on the second day, I reheat it with some leftover cooked rice, pasta or even spelt. If it’s cold outside, or I’m simply too busy for multiple courses, I just throw in some beans to transform this light soup into an earthy meal. At the end of the week I add a boiled potato and turn the leftovers into a creamy passato (blended soup) with my hand blender. Just keep in mind, if you plan on stretching your soup over the course of a week, that you should skip tomatoes or it will spoil too quickly. 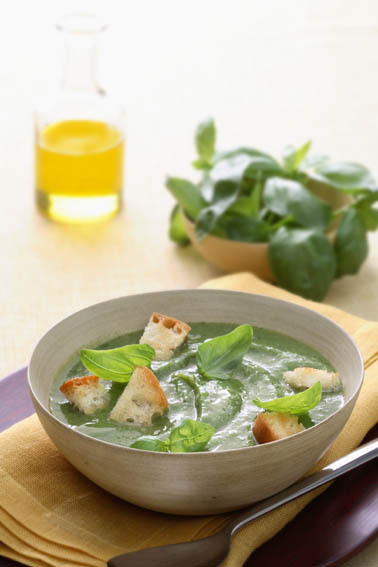 In Italy we have countless regional and seasonal variations for this soup, depending on the local produce! 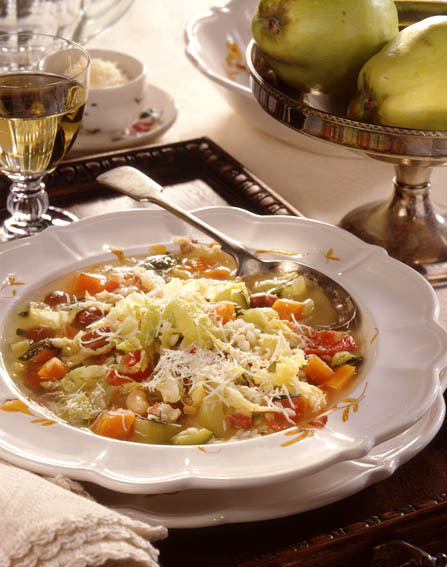 Just to give you a few examples, the Genoese minestrone is flavored with pesto; my Tuscan grandmother liked to add rosemary, and the Lombard one preferred Arborio rice in it. The only key rules are that all the ingredients should be very fresh and the oil high quality; the soup should be cooked very slowly, on low heat; and finally, the vegetables should be chopped very small, Israeli salad-style…. other than that, have some fun! Peel the carrots and potatoes with a vegetable peeler and wash and clean all the vegetables, discarding any outer leaves and inedible parts. On a chopping board, cut all the vegetables into regular dice max 1/2″ (except for the peas, obviously). In a large pot with a heavy base, heat 2 tablespoons of extra-virgin olive oil. Add the minced onion and the whole garlic cloves and cook until the onion is translucent. Discard the garlic (if using – I usually don’t), add the vegetables and little salt, and cook for another 5 to 10 minutes on medium/low heat, making sure they don’t burn or change color. Cover the vegetables with the vegetable stock and cook, in a partially covered pot and on low heat, for about an hour or until the vegetables are soft and the liquid has absorbed all their flavor. If using asparagus tips, add them later, about 15 minutes from the end. 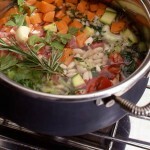 If you are pressed for time, you can also cook minestrone in a pressure cooker (it should take less than 15 minutes). When ready, pour into individual bowls, drizzle with some more extra-virgin olive oil and sprinkle with a touch of freshly ground black pepper. It also tastes great with some freshly grated parmigiano on top, if you are in the mood for cheese!. 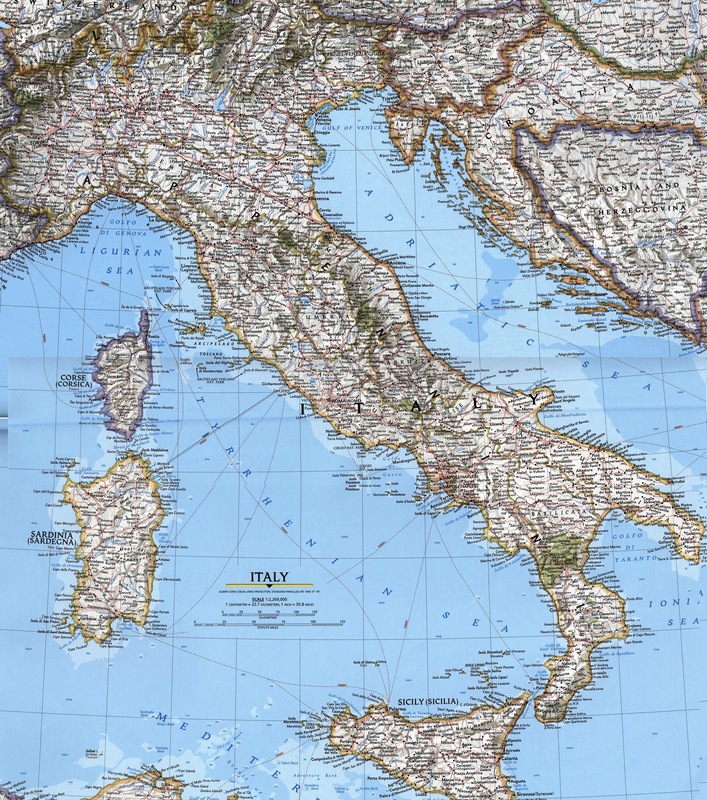 The Jewish community of Rome dates back to the second century BCE. Its history is known from several Latin and Greek sources, the Talmud, and inscriptions found in the catacombs. “Rabbinical” Judaism, whose core thoughts are collected in the Babylonian Talmud, originated towards the end of the first century CE, after the Temple of Jerusalem was destroyed. Its center was the academy of Yavneh, which in theory was also in charge of the Jews in the Diaspora. We know from the Talmud that at the beginning of the 2nd century CE, a certain Rabbi Matthias was sent from Yavneh to Rome. However, the Romans did not always accept his authority: the Talmud reports that the leader of the Roman community, Theudas, refused Yavneh’s instructions to modify the way the Passover lamb was butchered. We gather from these passages that in Judaea the ritual must have been changed after the destruction of the Temple. 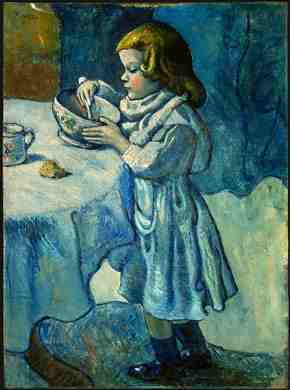 In most communities around the world, the custom of eating lamb at the seder was eventually abolished “until the Temple will be restored”. However, because of Theudas’s refusal to follow the dictates from Yavneh, the Roman community continued to prepare the Passover lamb as always (until even Yavneh gave in and accepted the difference). To this day, Roman Jews (who are very proud to be neither Ashkenazic nor Sephardic) serve lamb at their Seder. *Lamb shoulder is more widely available than leg, because of how labor intensive removing the sciatic nerve is (a requirement of Jewish dietary laws). One of the few kosher butchers in the US who carry lamb leg is Bisrakosher in NY (and their lamb is grass-fed). Rinse the lamb, dry with paper towel, and make some small incisions into the meat with a small pointed knife. This technique has a not-so-kosher name, itâ? ?s called â??lardingâ?? the lamb. Remove the leaves from 2 of the rosemary sprigs and cut the garlic cloves into 4 parts length-wise. Cut the lemon peel or sun dried tomatoes into pieces if using. Insert 3/4 of these rosemary needles, garlic and the lemon or tomato into the cuts. Combine the remaining 1/4 with about 1/2 cup oil and some pepper. Brush the lamb all over with olive oil, sprinkle with salt and pepper and drizzle with 4-5 tablespoons dry white wine (or a mix of lemon and wine), and place in a roasting pan. Roast for about 1/2 hours or until cooked inside and golden-brown on the outside. 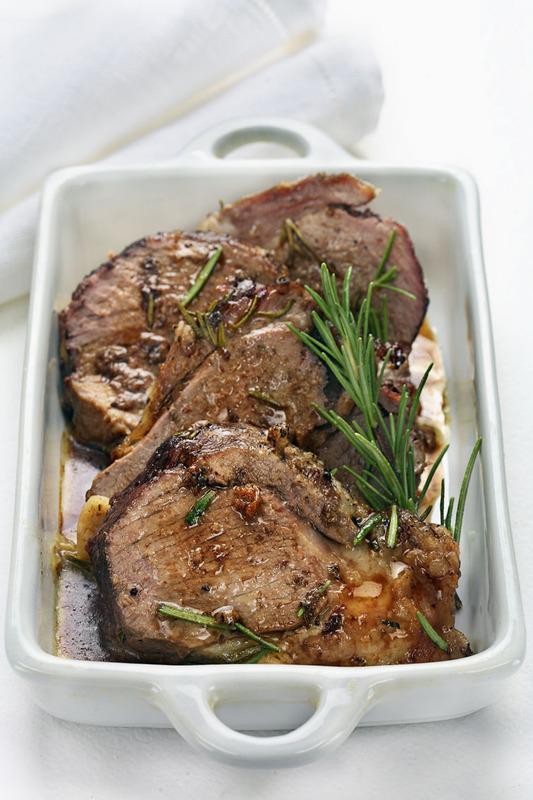 In general, lamb should be roasted for about 25 minutes per pound, or until a meat thermometer inserted in the roast reads 150. 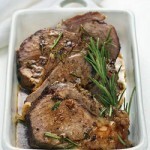 Turn the lamb halfway through the cooking, and baste every 15 minutes with the herb/oil emulsion and the pan juices. Remove the lamb from the oven and allow it to rest covered for at least 15 minutes before serving.